So, let’s take a normal day at the office… You wake up, get ready, go to work and then you sit down to start your day. Out of nowhere you feel your neck stiffening up. And then…“Ouch! I must have slept funny…”. How many of us have experienced this? Some of us actually experience it regularly! Why? Because poor posture becomes a habit! And a very bad one! WHAT HAPPENS WHEN YOUR NECK & SHOULDERS STIFFEN UP? 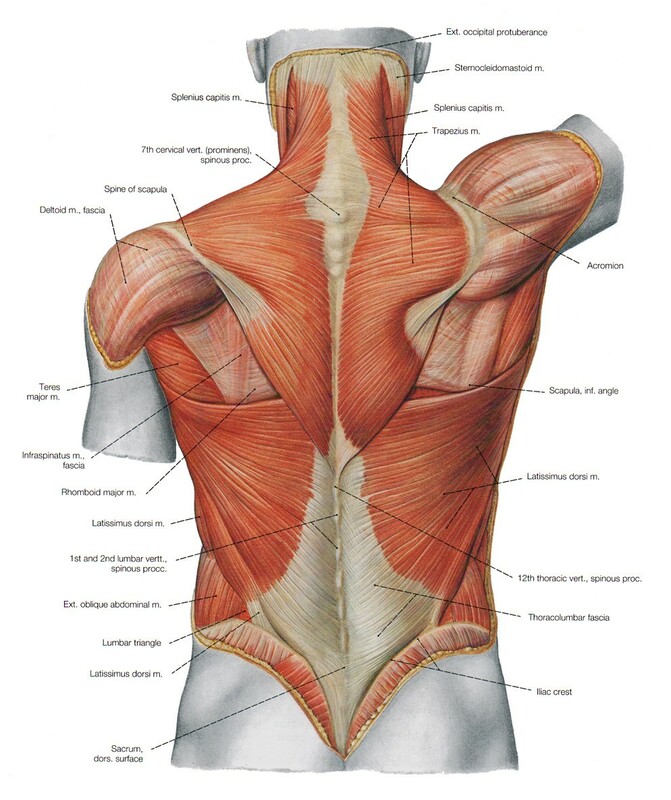 As you can see from the diagram above, there are a large number of muscles covering the neck the shoulders, the lower back and the hips. If the neck and shoulders stiffen then they will start pulling lower down where your lower back is and into your hips. This could lead to lower back pain, hip pain and much more. Think of it like an elastic band starting from your neck stretching all the way into your hips. The band stiffens up on one end (neck) and therefore it will start pulling the other end (lower back and hips). Now when your lower back and hips start hurting (the other end of the elastic band) they will start pulling the muscles at the top to take revenge! And this will become a vicious circle of pulling and pain! Don’t forget you won’t feel all these pulls and all the “arguments” between your muscles. What you experience is discomfort! This discomfort as you can now appreciate is the result of different pulls which you were not aware of in the first place because you were simply sitting down the way you always do at work and probably outside work, at home too. And maybe the reason you are still sitting badly whilst reading this is because you haven’t read my previous blog on posture! Sit up!